Products – Cameras – CM-MV100 – Team Research Inc. Whether you want to check in on what your pet is doing, see if the kids are safe, or just want the reassurance of knowing that your home is secure, the Astak MobiVue HD is the perfect way to keep an eye on what matters most. You can view your MobiVue HD from your mobile device anytime from anywhere in the world, giving you peace of mind. MobiVue is an all-in-one cloud-based WiFi network camera. This unit brings home video and audio surveillance to your smartphone and tablet in three easy steps. Micro SD card slot with 8GB card included (upgradeable to 32GB) provides on-board video storage. 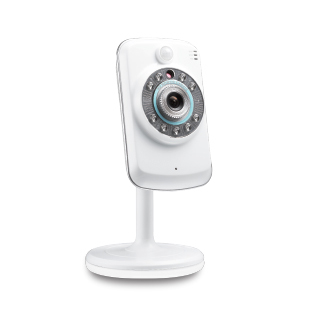 View and control the MobiVue in vivid 720P HD live video, stay connected to your family members, friends, pets or home. MobiVue only uses bandwidth when accessing the camera. So no slowdown in internet speed while working, surfing or gaming on the Net. Receive motion alerts and push notifications from the MobiVue. Stream live feed and playback recorded videos directly on your smartphone or tablet. Supports PC, MAC,iOS (iPhone,iPad) and Android devices. Setting up the device is simple and requires no use of software or CDs. Simply download the free Astak MobiVue app for Android or iOS, available on the App Store® and Google Play®, to your mobile device. The intuitive setup wizard helps you to begin viewing your camera in a matter of minutes. • The Mobivue 100 comes equipped with a faster chipset than its predecessor, offering better performance. HD quality, 1280 x 720 resolution. • Features two-way audio intercom and multiple camera setup are now accessible via smart phone iPhone/Android. • H.264 Video compression and free manufacturer’s DDNS included. • Completely redesigned WebUI, wider viewing angle of 100°. • Real plug and play – three minute setup!